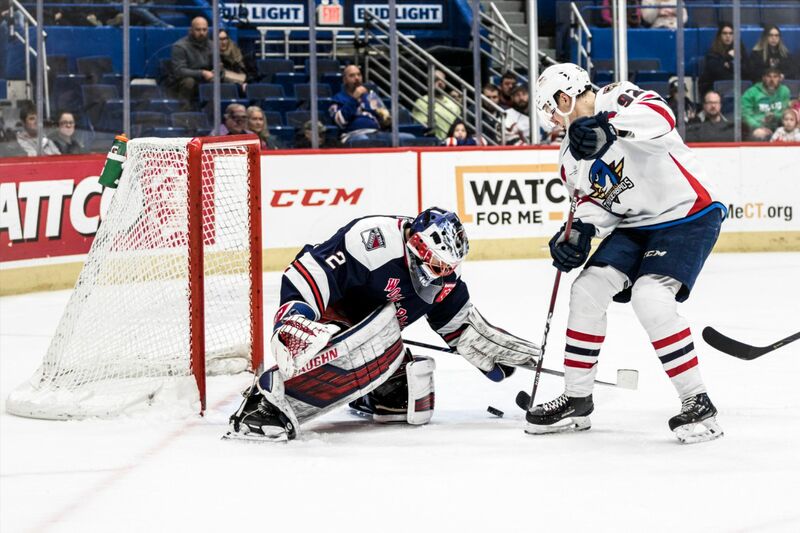 Hartford, CT, January 23, 2019 – Paul Thompson scored four goals, including a natural hat trick in the third period, Wednesday night at the XL Center, leading the Springfield Thunderbirds to a 7-4 win over the Hartford Wolf Pack. 1st Period-1, Springfield, Greco 17 (Lammikko), 0:50. 2, Hartford, O’Gara 3 (Day, Meskanen), 1:42. 3, Hartford, Andersson 6 (Fogarty, Gropp), 5:16. 4, Springfield, Thompson 19 (Bystrom, MacDonald), 6:21. 5, Springfield, Zolnierczyk 9 (Hunt), 13:51. 6, Hartford, Gilmour 13 (St. Amant, Fontaine), 16:22. 7, Springfield, Jurco 3 (Greco, Repo), 18:00 (PP). Penalties-Andersson Hfd (hooking), 16:34. 3rd Period-9, Springfield, Thompson 20 (Zolnierczyk), 8:30. 10, Springfield, Thompson 21 (Zolnierczyk, C. Wideman), 10:17 (PP). 11, Springfield, Thompson 22 (Lammikko), 18:33 (PP EN). Penalties-Farnham Spr (slashing), 3:16; Lindgren Hfd (roughing), 3:16; Jurco Spr (tripping), 4:17; C. Wideman Spr (cross-checking), 5:32; Hajek Hfd (tripping), 8:53; O’Gara Hfd (slashing), 9:44; MacDonald Spr (hooking), 13:08; Bigras Hfd (high-sticking), 17:23. "Pack come out on losing end of wild night with Springfield", 5 out of 5 based on 2 ratings.